One of the oddest duets in the history of music occurred in 1977 when Bing Crosby was in London to film his final Christmas special. Looking for a young local musician with whom to share a song, Bing's people settled on David Bowie. That's Ziggy Stardust-era David Bowie—about as avant garde as was humanly possible in 1977. Peace on Earth is a continual theme during Christmastime. 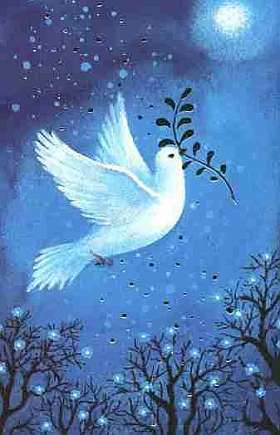 If you want to send a Christmas card with a religious theme that is considered universally "acceptable," you can't go wrong with one depicting a dove carrying an olive branch. Unfortunately, pinning down what peace is proves to be as large a study in contrasts as Bing and Bowie. One of the odd things about the idea of peace is that we tend to think of it not as was it is, but what it isn't. Peace is viewed as being "not war." You're just as likely to get a definition of Paul's list of concepts as not lies, not dishonor, not unfairness, not corruption, not ugliness, and not triviality or cheapness, either. The positive side of ideas like peace or purity get lost in our tendency to work toward the good by thinking of an absence of the bad. What we are left with in many cases is a deficient idea of what kind of peace Christ has purchased for us by His death and resurrection. We tend to think of peace in 2005 as an absence of stress or conflict. Because of this, we fall prey to the world's peace, a man-made utopian ideal that pursues peace by removing anything that interferes with the goal of total tranquility. Again, negation is what drives us, not true peace. Unshakable peace is not the absence of something, it is the presence of someone: Jesus Christ. The contrast with the world's peace versus the peace that Christ alone can give could not be starker, yet how poorly so many of us perceive the difference, even in the Church. The peace Christ gives is Himself. We overcome strife because He did and He dwells in us. The peace He gives has teeth because it stands in stark contrast to the peace the world gives, overcoming it by faith. Therefore at that time certain Chaldeans came forward and maliciously accused the Jews. They declared to King Nebuchadnezzar, "O king, live forever! You, O king, have made a decree, that every man who hears the sound of the horn, pipe, lyre, trigon, harp, bagpipe, and every kind of music, shall fall down and worship the golden image. And whoever does not fall down and worship shall be cast into a burning fiery furnace. There are certain Jews whom you have appointed over the affairs of the province of Babylon: Shadrach, Meshach, and Abednego. These men, O king, pay no attention to you; they do not serve your gods or worship the golden image that you have set up." Then Nebuchadnezzar in furious rage commanded that Shadrach, Meshach, and Abednego be brought. So they brought these men before the king. Nebuchadnezzar answered and said to them, "Is it true, O Shadrach, Meshach, and Abednego, that you do not serve my gods or worship the golden image that I have set up? Now if you are ready when you hear the sound of the horn, pipe, lyre, trigon, harp, bagpipe, and every kind of music, to fall down and worship the image that I have made, well and good. But if you do not worship, you shall immediately be cast into a burning fiery furnace. And who is the god who will deliver you out of my hands?" Shadrach, Meshach, and Abednego answered and said to the king, "O Nebuchadnezzar, we have no need to answer you in this matter. If this be so, our God whom we serve is able to deliver us from the burning fiery furnace, and he will deliver us out of your hand, O king. But if not, be it known to you, O king, that we will not serve your gods or worship the golden image that you have set up." 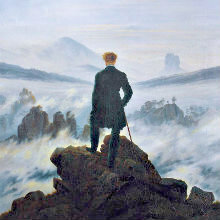 Two stark contrasts are depicted in this passage. The world's peace is for the trio of Shadrach, Meshach, and Abednego to bow down to the idol. It is the peace of worldly conformity. However, they chose the peace of God, letting Nebuchadnezzar know that there is a peace that passes understanding, the peace that Christ modeled for us when He went as a lamb to the slaughter, the devil's lie ringing in His ears, "Come down from the cross; you are the King of Israel, are you not?" Death brings peace. Not a funeral goes by that someone says of the deceased that he or she is at peace. But one of the reasons Christ endured crucifixion was to offer a peace that comes only by death on a cross. And so He showed us the way as we too join in saying that we would rather die at the cross than worship the idols of this world. Only the dead to the world know the peace an exchanged life brings at Gethsemane, Christ's for ours. This Christmas, let us rightfully consider what peace is. It is not the absence of war, conflict, stress, and turmoil; it is the overcoming presence in our lives of the God-man born in a stable, who grew to maturity, learning obedience, and dying so that we might bear the seal of His peace. May we have more of Him and, in turn, know godly peace. It seems to me that this description of peaceï¿½poise, confidence and a sense of well-being in the midst of conflictï¿½is a neglected one. But I don’t see how we can fail to cultivate this kind of peace if we’re going to be disciples who make a difference in a lukewarm church and an increasingly hostile world. The illustration from Daniel was an apt one for me, as this very passage was one the Lord spoke to me from a couple of years ago in preparing me for what has happened since then. Beautiful pic. Where’d you get it? You must listen to the same station I listen to~ ok, maybe not, but when they aired the Bowie/Bing duet a few days ago, I pondered the odd couple, just like you did, here. But I thought about lifestyles being able to agree on one basic thing, and that was about it, for that subject! If I’m not focused on Christ, everything and anything, no matter how small, can shake my peace, regardless. The image was from a clip-art site. I suspect its greeting card image, but I could find no copyright info. And no, I don’t remember the site.